LUCY BURDETTE: Hooray! Barbara Ross has a new book in her Maine clambake series out next week. And she agreed to visit us with tales of Hazelnut Christmas cookies and news of the book...welcome Barb! BARBARA ROSS: Thanks so much for having me, Lucy. We moved this year. It was a big move and we’re still unpacking. We’re celebrating Christmas with our son’s family, so we’ve barely decorated our new house. No tree, no stockings hung by the chimney with care, no holiday mugs to fill with cocoa or eggnog. 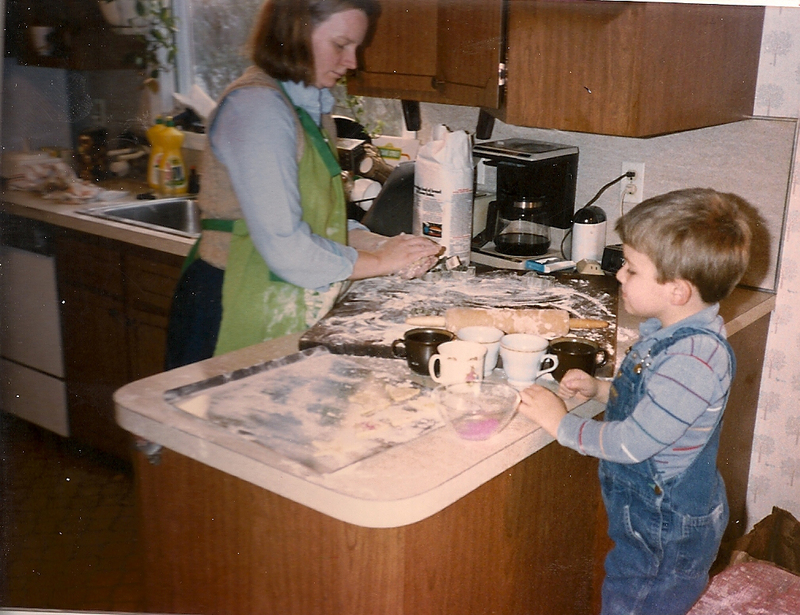 But there was one tradition I couldn’t ignore—cookie baking. I’ve been making six kinds of Christmas cookies for more than forty years. If I’d skipped this activity my family would conclude that something is terribly wrong with Mom. So rather than face that, I found the baking sheets, the cookie cutters, the tins and other necessities. Five of the six kinds of cookies I make come from a book of recipes made by my maternal grandmother the year before she died. We are into at least the sixth generation making some of these, so I can see why my family has expectations. One of the types of traditional cookies I make are the hazelnut wreaths. They are delicate and delicious with the flavor of the nuts, which some people call filberts. 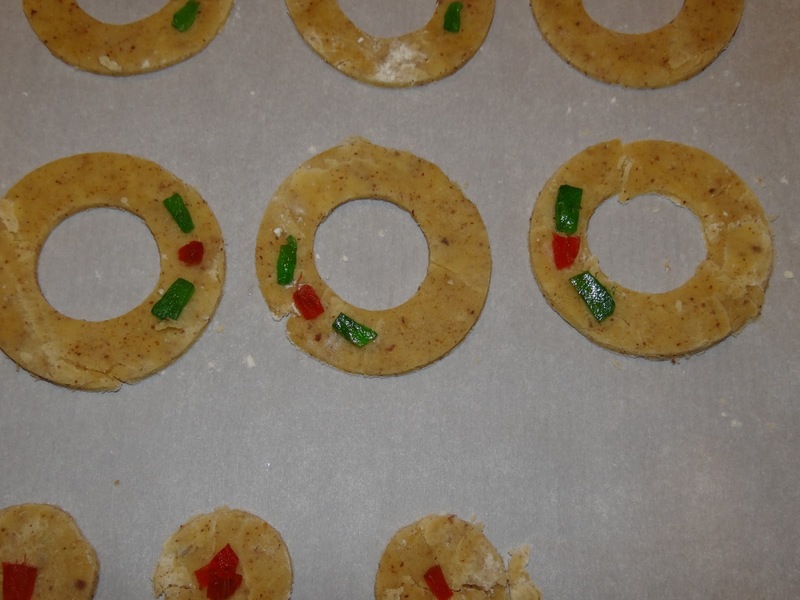 They’re cut with a donut cutter to make the round wreaths and decorated, in the absolutely worst job of the entire cookie-making extravaganza, with red and green dyed candied pineapple intended to suggest a bow. This involves sticky fingers and lots of cursing and everyone usually scatters when I am looking for volunteers. My husband Bill was kind enough to do the job this year. The truth is I’m not much of a baker. Aside from seasonal fruit pies, the Christmas cookies are often the entire output of my baking year. My hazelnut wreaths look more like hazelnut flat tires and my butter cookie animals usually look like they come from a farm where someone is doing monstrous DNA experiments. The cookies aren’t as good as my mother’s, who was convinced hers weren’t as good as her mother’s, and so on through the generations. Here is the hazelnut wreath recipe. May the more intrepid among you enjoy both the baking and, especially, the eating. They are worth it. Cream butter and sugar and set aside. Form the dough into flat circles about the size of a saucer. You will get four to six of these. Wrap well in wax paper and place in refrigerator for four hours or overnight. Remove one dough circle from the refrigerator and roll it out flat on a floured surface. Cut into rings, using a cookie or doughnut cutter. 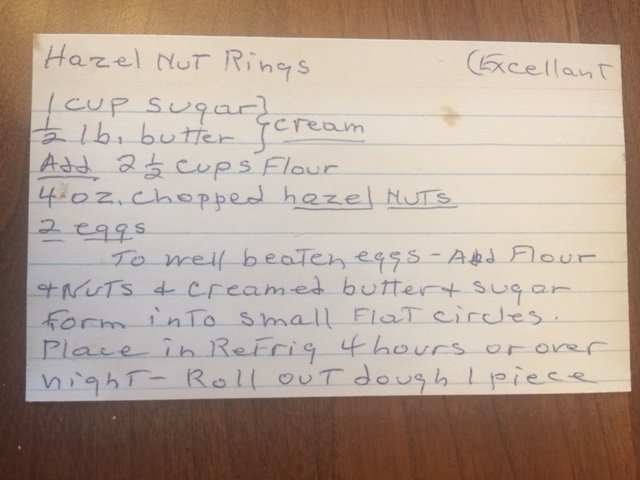 Place rings on a parchment-covered cookie sheet. When you have cut as many rings as you can, reroll the remaining dough and cut again until you have used all the dough. Then remove the next batch from the refrigerator and repeat. Prior to baking, decorate as you wish. We use candied pineapple to form little bows on the wreathes with a red center and green at either side. However you choose to decorate, do it lightly. The flavor of the cookie is delicate and you don’t want to overwhelm it. Bake at 350 degrees for ten to twelve minutes. The cookies should be lightly brown. Readers: Do you have something you do or make every year that you just wouldn’t be you if you didn’t? 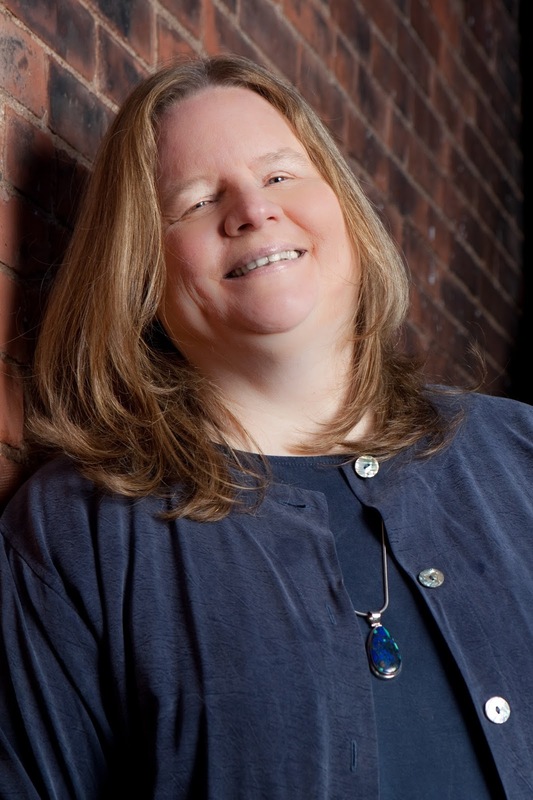 Barbara Ross is the author of the Maine Clambake Mysteries: Clammed Up, Boiled Over, Musseled Out, Fogged Inn and Iced Under. Stowed Away, the sixth Maine Clambake Mystery will be released December 26, 2017. Her holiday novella featuring amateur sleuth Julia Snowden is included with novellas by Leslie Meier and Lee Hollis in Eggnog Murder from Kensington Books. Barbara’s books have been nominated for multiple Agatha Awards for Best Contemporary Novel, and RT Books Reviewer’s Choice Awards, as well as the Maine Literary Award for Crime Fiction. She blogs with a wonderful group of Maine mystery authors at Maine Crime Writers and with a group of writers of New England-based cozy mysteries at Wicked Cozy Authors. In the summer, Barbara writes on the big front porch of the former Seafarer Inn at the head of the harbor in Boothbay Harbor, Maine. Congratulations on your new book, Barb . . . . Your hazelnut wreaths sound yummy . . . there’s something very special about having a well-loved family recipe.Thanks for sharing it with us. We do the Christmas cookie bake around here, too . . . seven or eight different kinds makes sure everyone gets their favorite . . . and we always have homemade cinnamon rolls [my Mom’s recipe] for Christmas morning. I also make Easter Egg Bread every year . . . everyone expects it to show up on the table, and I certainly wouldn’t want to disappoint anyone . . . .
Cinnamon roll for Christmas morning, that sounds amazing. 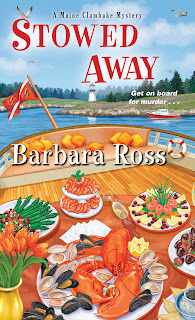 Congratulations on the upcoming Boxing Day release of Stowed Away, Barb! I adore the Clambake mystery series and am looking forward to reading this soon. I love hazelnut desserts so I will save your hazelnut wreaths recipe to try another time. I was a baker first, but I also do not like making very sweet desserts. For about 15 years, I have been making almond stollen instead of fruitcake to give out as gifts. And since I really love all things chocolate, I am going to try a new flourless version of the chocolate crinkles cookies I saw online by one of my favourite chefs, Anna Olson (Ontario). Hi Grace. I'm so glad you like the series. The hazlenut cookies are not too sweet. They have a delicate flavor and the nuts come through. Give them a try! Hi Barb, in my part of Maine they are called noisette and we have trees of them in the woods on our property. You cannot imagine the color of your hands after you strip the sticky covering from enough of those tasty little nuts to make cookies. Or the battles you have with squirrels and chipmunks to be first in line to take them from the trees! They have always been my favorite nuts. Butter cookies have always been my tradition. Until this year when Hurricane Irma blew up my oven I would start baking around Halloween and continue through Thanksgiving. Butter cookies freeze beautifully so they are always handy for a quick gift--if the family leaves any. Noisette! Of course. I know I have life easy since I can buy the nuts shelled and chop them up in the Cuisinart. My grandmother used to shell them and then beat them with a rolling pin. I also make butter cookies but haven't this year yet. I'm going to do it with my granddaughter on Saturday. That hazelnut recipe looks yummy. I cannot bake to save my life, but every Christmas Eve I make up a vat of seafood gumbo. That's my thing. Best wishes for Stowed Away! I don't make or do anything that makes it the holiday season. However, my aunt makes what I call her "World Famous Chicken Dish" that I do consider a holiday season must. She made it for every Xmas Eve extended family gathering and I looked forward to it all year. Heck, I used to give her the container I brought for leftovers BEFORE the meal was served so I could make sure I had leftovers to bring home. I don't know what it is actually called but given how much I love the thing I prefer calling it her "World Famous Chicken Dish". She did give me the recipe but I'm too lazy to make it myself. I tell her that it is because it wouldn't be the same if she didn't make it with her tender loving care. It must've worked because since the family gathering ended last year, she's brought me a dish of the meal both last year and this one. I'm so glad to have this recipe, Barb! They sound delicious. I think I would sprinkle green sugar on instead of the candied fruit. I make four or five kinds of cookies every Christmas, too. I've already baked the gingerbread people, and the dough is made for the sugar cookies, the Mexican Bridecakes, and the Spritz cookies (the ones you squeeze out through a press). Still go are the green and red spiral refrigerator cookies that you freeze and then slice off a long log. A yummy time of year, especially with your latest book to read along with a cookie. Thank you, Edith. Best of luck with the cookie-making. Can't wait to try that recipe! I'm always on the lookout for something new and different. These will be very special. Thank you! You are on the look out for something new and different, whereas I am reassured by doing the same thing every year...I love people. What a fun memory of growing up! We used to make holiday cookies, The kind that you smash through a metal template in a cookie press. I think there were reindeer, and stars, what else might there have been? And then we decorated them with colored sugar. This is so interesting, because this is a dregged-up memory from literally 60 years ago. Can it be true? Is there such a thing? Yes, Hank. Those are Spritz cookies, and I make them every year with my mother's press. Thanks, Hank. I've never made those kinds of cookies, but I think it's interesting that you found that memory. Yes, I do, too! SO funny. Thank you! I LOVE spritz cookies! My mom made them and a couple of my sisters make them. I don't have the patience to make them but I don't at all mind eating them! A few years ago a cookie bakery moved in around the corner from where I live. She makes the crispy kind of cookies I love. I used to bake a lot of cookies at Christmas but with the best cookie bakery EVER around the corner from me I no longer need to bake. Plus, I'm supporting a local small business owner, and she and her employees are the loveliest people! 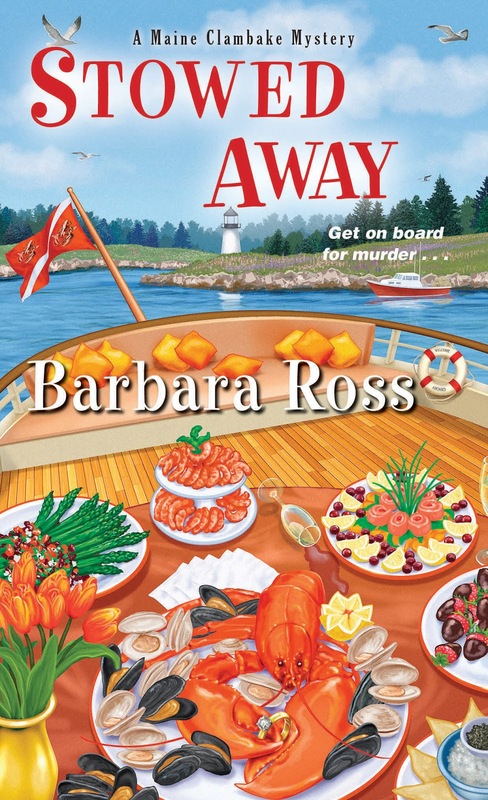 A new Maine Clambake mystery from Barbara Ross is reason to celebrate!! I love this series. Those hazelnut cookies sound fabulous - I make a version of them for linzer tortes - two thin hazelnut cookies make a sandwich with raspberry jam in the center. My holiday cookies are 2: walnut cookies rolled in powdered sugar and mandelbrot (twice baked studded with chocolate and cherries and walnuts). I also make chocolate-covered orange rind which is my own tradition. Gifts to the men in my family who are brutal to shop for. Of course there's a cookie press! She said, never having seen or used one. Or perhaps they are apocryphal. See my comment to Hank! I'll take pictures later today when I bake them. Hallie what is this chocolate orange rind of which you speak? I have chocolate and three oranges. What do I do next? Thanks in advance. Yes, Hallie, the chocolate covered orange peel sounds divine! I would love the linzer tortes, too! I've made Hallie's chocolate orange rind. It's divine. But labor intensive, be warned. Yes, Hallie, I looked them right up. They are fancier now, but still the same deal. A flat disc with a cut-out shape, like a star or a tree, and you twist a knob to goosh the dough through. I have your Mandelbrot recipe. Must try! I've used a cookie press. Owned one for decades, but only used it twice, maybe? The cookies I made never looked remotely like the ones they were meant to resemble. Cookie press failure. Sad. Chocolate covered orange rind is a day-long adventure. Step 1: go to that candy-making Zen place. It's the same as the pate-making and bread-making Zen place. Then, peel lots of oranges (this year I peeled 7 cara cara oranges - I peel it in strips lengthwise). Boil the peels til soft (20-30 minutes). Scrape away some of the white part so it's mostly the 'zest,' cut in strips. Simmer zest strips in 1/2 cup of water and 1 cup sugar (enter candy thermoneter - get it up to 230 degrees), drain in a mesh sieve, cool on a cookie sheet. Melt dipping chocolate. Cip one end of each piece in melted dark chocolate and the other end in sugar (keeps them from all sticking together). Oh dear. Haven’t had a candy thermometer in decades. But I have resources and can go buy one. Really want to try this. If I didn't make pumpkin pie for Thanksgiving, and chocolate chip and sugar cookie cutouts for Christmas, there'd be an insurrection in my house. Fortunately, the kids helped out with the baking this year, so everything went really smoothly. Insurrection. That's what I'm talking about. I don't bake at any time of the year, but I sure love to eat other people's! And I love watching cooks and chefs baking and cooking online. My current favourite baker is Gemma Stafford, a lovely Irish woman living in Los Angeles. I get all the pleasure of (watching her bake) and none of the calories (of eating the product). That's a win-win, in my books. Happy baking to all of you out there who enjoy doing it -- or do it because you have salivating fans waiting for the results! Isn't that interesting how it's fun to watch other people cook and bake? At first I didn't get it at all. You can't smell it or taste it, which would seem to be the most pleasurable part. But then I got hooked on the early years of Top Chef. Every year at Christmas Warren used to make spritz-type cookies from a recipe he got from his grandmother. The rest of the year we spent countless hours in cookware stores, looking for the perfect cookie press. Sometimes he would experiment with the recipe as his dietary needs became restricted. This resulted in the infamous Year of the Salt Nuggets, when he tried to use egg substitute instead of eggs. After that he stopped tinkering. The recipe and an excellent cookie press have been passed down to his daughter, so the tradition continues. Thanks for the recipe, Barb, and the new book!! My sisters and I get together and bake about 4 kinds of cookies before Christmas, as well as make sauerkraut balls. I have two other traditions--one is to make some of my mom's peanut butter fudge--both chocolate and vanilla varieties (no recipe to share--we learned from helping our mom) and the second is to add something new to the mix. Since we'll have plenty of sweets, this year I'm going to try Rhys's sausage rolls! I am fascinated by the sauerkraut balls...I love sauerkraut pierogis. Does this mean I would like them? I think you would like these--small bite-sized morsels. Not sure what's in them besides the sauerkraut and sausage. Mix, refrigerate, then form into balls, roll in flour, then egg mixture, then I think cracker crumbs. Deep-fry in small batches. Serve with a variety of dipping sauces--we like to try gourmet mustards. Makes a ton and they keep well--except around here where there are never enough! Merry Christmas Barb, and congrats on the new book. Hazelnut anything sounds wonderful and those wreaths sound better than the hazelnut dacquoise I'm pining for. I even found my grandmother's doughnut cutter, so I'm set to go. My traditional baking includes sugar cookies, which are done but not decorated, date bread, which isn't happening until next week, to take to the family party, a loaf for everyone, sausage rolls of course, will make those Saturday, same with the mince pies. I used to do lots more but as I get older and then drop in guests get fewer, I've cut down. This year we are starting a new tradition. We are making cioppino for Christmas. I doubt I'll get seven fishes in it but we'll be close. Haven't decided whether to have our big meal on Christmas Eve, a very busy day to be topped off with Midnight Mass, or to put it together for our Christmas lunch. Everyone who hasn't tried Rhys's sausage rolls, please do. You'll never go back. Trust me. I am a nurse. If you don't eat pork, you can use turkey sausage, not quite the same but passable. How do I not have this recipe for sausage rolls?! We did our 7 fish last weekend at my brother-in-law's. We used to do it Christmas Even, but then everyone was exhausted on Christmas day. I am definitely going to try the sausage rolls. Do you do Rhys's mince pies in the muffin tin. I did them for the first time last year and they worked out great. I've made my own mincemeat for decades. How did I miss Rhys's homemade mince pie recipe??? I love mince pies! Hi Barb! So lovely to see you here, and congrats on the new book! 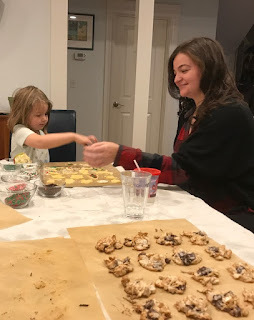 Your hazelnut cookie recipe sounds wonderful but I have to admit I have never made Christmas cookies--that's just not in my family tradition. Isn't that weird? My grandmother used to make snickerdoodles, but I don't remember her making them at Christmas, and I don't remember my mother every making cookies. She made pies! Next year when my granddaughter is old enough to help, maybe I'll try sugar cookies. I usually make apple pie at Thanksgiving, as hubby doesn't like any of the traditional TG pies. And every year I make Crescent Dragonwagon's Black-eyed Pea soup for New Year's Day. So good! I make an apple pie at Thanksgiving for my daughter--same reason! Deb, I already have the black eyed peas inner he freezer. Need to double my NYD intake after the year I’ve had. That's a great idea. I was using tartelet pans, but didn't love the results. Wonderful tradition of making those family cookies! We have a family recipe for Sour Cream Cookies that I make most years. It was my mother's Aunt Hattie who passed on the recipe so we call them Aunt Hattie's recipe. I think the thing I make that people really miss if I am too lazy is fudge - chocolate w/nuts, and peanutbutter w/nuts. I also make the pecan chocolate chip pie that has become a family favorite. Sour cream cookies, two kinds of fudge and pecan chocolate pie? Your holiday baking sounds amazing. Pauline, I might actually bother to bake sour cream cookies. Would you share your recipe? I don't have any must do food making traditions, but my mom has several Christmas goodies I look forward to every year. Of course, since they are redoing this kitchen this year, I don't know if those got made this year or not. I guess I'll find out when I head home tomorrow. Safe travels, Mark and have a Merry Christmas with your family. On a sad note, does everyone know Tim Cleeves died on Friday? Louise Penny posted it on Facebook yesterday. On Christmas morning we always make cinnamon rolls, which bake while we're opening gifts and sipping coffee or hot chocolate. When the rolls come out, my daughter insists on mimosas to accompany them. I used to make a sour milk coffeecake from my own childhood, but the kids all like the rolls better, so we've done that for the last 10-12 years now. This year I'm reviving the pork roast for dinner tradition. I make a recipe that is so delicious, with garlic, rosemary, dried apricots, and cranberries. We used to have it every year when my father-in-law was alive, but we have more people who host now, and I have not cooked Christmas dinner in a long time. Since the Bengals are playing on Christmas Eve, my daughter and her family are coming here for the game this year, so I'll cook for the whole family. With lots of help, of course. And for dessert I made homemade peppermint ice cream, and will make the flourless chocolate cookies Grace referred to above. They are so darned good. Someone else is bringing the pies. I make a chocolate pecan pie, too, but we have nut haters in the family, alas. I like fruitcake, too and have a great recipe though I haven't made it in years. I love peppermint ice cream and would love to taste homemade. I also make cinnamon rolls on Christmas morning (as my mother did), Karen, and have mimosas with them (as my mother didn't...)! Barb, would the hazelnut cookies work in just plain rounds, and with no decorations? Because they sound fantastic for other occasions, too. We have mimosas, too, but this year instead of OJ I think we're using a splash of Italian Blood Orange soda. They were tasting the combo at Trader Joe's a few weeks ago and it was delicious! Hi Karen--I don't see why not. The trick is to roll them thin. Oh, gosh, that sounds good, Debs. Maybe I'll get some to try this year. Homemade peppermint ice cream! That sounds SO yummy! Karen, I think if you made the hazelnut cookies plain you could dress them up with a dusting of powdered sugar. Hi, Barbara! Thanks so much for sharing the cookie recipe. I will see if I am up to the challenge. I am more of a baker than a cook, so maybe. I adore your clam bake series and am just delighted that there is new one coming out! Going to pre-order it now. Happy Holidays! Jenn--I'm sure you're up to the challenge! So glad you like the Maine Clambake Mysteries. I second the motion about the great blessing of food processors! It is not Christmas unless I make apricot-coconut balls. When I was a kid, we used a hand grinder for the dried apricots and then mixed in the flaked coconut and "Eagle Brand" milk by hand. Now a processor does that in mere seconds! Still have to roll out all the balls by hand though... A few years back I took some to an adult literacy tutoring event, and the retired nun sitting across from me almost cried! "We made them when I was a child!" she said. At her house, the kids had to chop all those apricots *by hand*. You can be sure that she went home with all the leftovers that night. Aw...that's such a sweet story! Apricot coconut balls That sounds like my kind of sweet. Going to look it up right now. Do you ever make them dipped in chocolate? Okay, I posted a response to this in the morning. I saw that it posted to the thread. I came back 30 minutes later and it was gone. Since there was no cussin' or anything like that, I'm left to wonder what is going on with my posts. This is the third or fourth time it has happened. I have no special traditions that I do as far as making foodstuffs to eat for the holidays. However, my aunt makes this dish. I can't remember what it is called exactly but I refer to it as "My Aunt's World Famous Chicken Dish". When we did the big family gathering each year on Xmas Eve, this was the dish I pestered her to make and looked forward to all year. I even gave her my containers for leftovers BEFORE the meal was served to ensure that I got a healthy portion of said leftovers. Now that we don't have the gathering anymore, she gave me the recipe. But since I'm too apathetic or lazy or both to make it myself, I've had to resort to outright bribery/flattery. Yes, I tell my aunt that it isn't the same dish if it isn't made with her tender loving care. And the last two years, I've gotten a pan of the dish around this time. And it has been delicious as you might expect. I just mixed up black walnut cookies to bake tomorrow. I hope they turn out as well as the black walnut cakes that I baked. 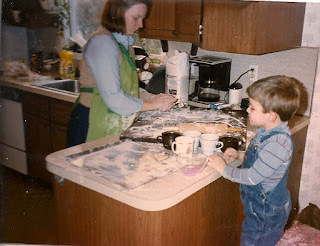 I'm not the great baker that my mother was. I take more after my dad and prefer cooking where you just throw things in. Diners, Drive-Ins, and Dives is another inspiration. Gonna try that hazelnut wreath.